Figuring out what to wear during monsoon is one big challenge. However, it is imperative to choose the right fabrics during monsoon. There are some events which you just can't miss no matter how heavily it rains. Opt for these designer crepe dress materials which are easy to dry. Even if you are drenched, these materials will quickly dry as compared to cotton. The prints and patterns of these dress materials are extremely eye-catching. These dress materials are the perfect blend of style and comfort. Travelling seems tedious, especially during monsoons. If your workplace is fully air-conditioned, it gets all the more taxing as you have to wait for your clothes to dry. These easy dry dress materials are a smarter alternative to your regular fabrics like cotton and linen. They are an ideal choice for everyday dressing. Stay away from fabrics that take a lot of time to dry and also stick to your body when wet. Love wearing handloom outfits? 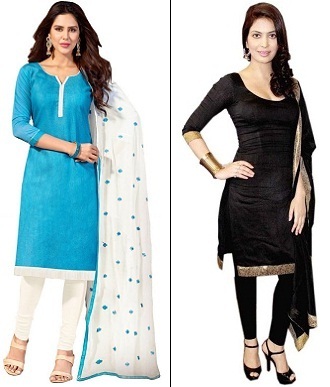 Take a look at these Chanderi cotton dress materials. 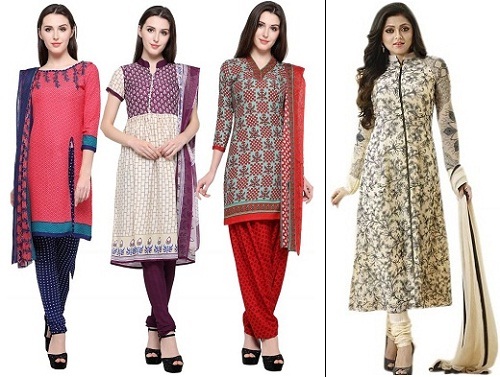 These Chanderi cotton dress materials are monsoon-friendly and come with eye-catching designs. Monsoons are usually very gloomy and dark. Make sure you pick outfits that are bright and colourful. These dress material sets enable you to play with colours. 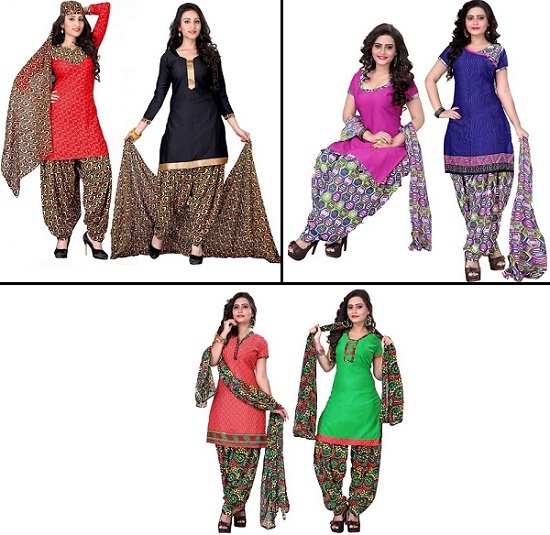 Each dress material set includes two kurta materials, one salwar material, and one dupatta. Out of two kurta materials, one is bright and the other is dark. Pick any one based on your mood and preference.